Decide you’re finally going to publish. Besides, Amazon says it’s easy. Spend a week trying to figure out how to get Scrivener to work so you can convert your files. Buy the Dummy book and discover you need one for people dumber than that. Pay someone to convert your files to mobi and epub. Find out later that there’s problems with the files, and Amazon and Smashwords accept Word documents. The nice guy on the other end of the phone at KDP tells you they actually prefer Word docs. Spend two days of intermittent frustration trying to get your headers with the page numbers and book title to work for your paperback. Discover that CreateSpace has templates just before your nervous breakdown. Load your books and discover there are problems with the files. Drink. Silently apologize to every self-pubbed author out there who has a book out that you didn’t like. They all figured this out and you can’t. Go try to fix the mistakes. Discover Amazon won’t let you put your book up for free. Fix the files (again!) and publish. Do a happy dance and put the alcohol away. Set up your author pages on Amazon, Goodreads, and Smashwords. Discover CreateSpace has the title wrong for your book. Send polite emails and pull the wine back out of the cupboard. When you’re filled with liquid courage, tell everyone you know that you have a book out. Put the alcohol away. Bite your nails and wait for reviews. Take a deep breath and smile. There. That wasn’t that hard. 15. Plan what to wear when Oprah interviews you. Practice smiling modestly for when she tells you she’s never read a book as good as yours. 16. Plan your acceptance speech to the Pulitzer Foundation. Phew. I’m glad my experience was a lot more straightforward. Well done for persisting. I was so happy when I figured out how to get rid of the header in the first page of each chapter that I may or may not have hosted a dance party for one in my kitchen. Oh, Lord! I’ll be doing this in a couple of months. Bookmarked your page and ordered a case of wine. 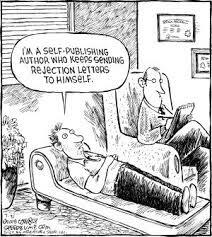 A lot of self-publishers can relate to this! It is certainly a trying process, but a rewarding one at that if you can come out on top.